The perfect plant to brighten up a room, lovely at Christmas and the perfect gift too! Bears a succession of heart shaped bright red blooms known as spathes with an intriguing central creamy 'spadix' against shiny ovate leaves. With little care plants bloom continuously. A native of the tropics it's happiest in a well lit room but away from direct sunshine and makes a lovely permanent feature. Easy to care for, keep out of full sun but give plenty of light. Water sparingly as compost becomes dry to touch and feed two ot three times a year. Delivered as a flowering plant in a 14cm pot with 5+ open flowers. 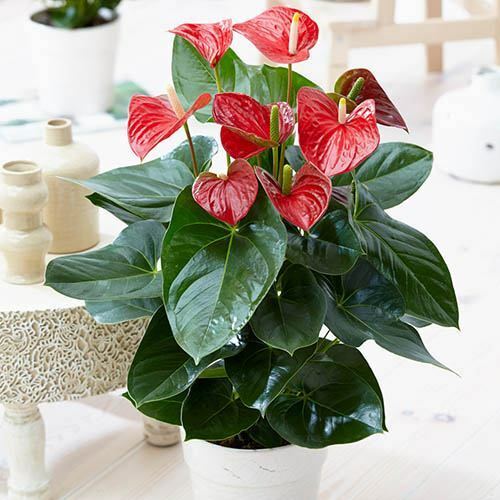 The perfect plant to brighten up a room, this Anthurium, with its red flowers and glossy green leaves, is perfect in the home or given as a gift at Christmas! Bearing a succession of heart-shaped, bright red blooms, known as spathes, they bear an intriguing creamy central 'spadix' which really makes for an eye-catching, exotic-looking flower. Borne against shiny ovate leaves which are the richest, glossiest green in colour, not only will this Anthurium look fantastic over the festive period, but with little care, the plant will bloom continuously - almost all year long! A native of the tropics, it's happiest in a well lit room but away from direct sunshine, making a lovely permanent feature to conservatories, living rooms and even as a dining room table centrepiece. The perfect house plant, Anthurium will add a decorative look to any room. Delivered as a flowering plant in a 13cm pot. Supplied as a potted plant in a 14cm pot, 50cm tall, with 5+ flowers.